On March 13, the New York Times quoted experts who said it was unlikely that the unfolding nuclear disaster in Japan will kill as many people as were killed by the 1986 meltdown at the Chernobyl nuclear power plant in the Soviet Union. But the New York Times has a long record of getting the facts wrong about nuclear power. Some of these errors and omissions are documented in two books by this reporter: "Grassroots Journalism" and "Good News: Local Journalism That Made a Difference." "The radioactive releases in the Chernobyl nuclear plant accident affected the entire northern hemisphere, as a book published last year by the New York Academy of Sciences documents. And 'Chernobyl: Consequences of the Catastrophe for People and the Environment,' authored by Dr. Alexey Yablokov, Dr. Vassily Nesterenko, and Dr. Alexey Nesterenko, finds that medical records between 1986, the year of the accident, and 2004 reflect 985,000 deaths as a result of the radioactivity released. Most of the deaths were in Russia, Belarus and Ukraine, but others were spread through the many other countries the radiation from Chernobyl struck. Where the radioactivity spreads after a nuclear plant meltdown is largely a function of where winds take the radioactivity and of the rain that causes it to fall out." In a March 13 interview, Grossman told the Valley Post that, if there is a major release of radiation in Japan, radiation could reach New England in "a few days," depending on wind speed and direction. "This would be affected by rain along the route. Also, mountains would cause fall-out, especially if it's raining in those mountains. Mountains would be a factor in blocking some of what would be in the wind." On March 21 at 7 p.m., several nationally known experts will speak about nuclear power at the Centre Congregational Church at 193 Main Street in Brattleboro. The speakers will be Dr. Arjun Makhijani, founder and president of the Institute for Energy and Environmental Research in Takoma Park, Maryland, and James Moore, director of the Clean Energy Program of Vermont Public Interest Research Group. Music will be provided by the Green River String Band. The public is welcome. There is a suggested donation of five dollars. A serious accident or act of sabotage at Vermont Yankee would kill thousands of people and leave hundreds of square miles of land uninhabitable. 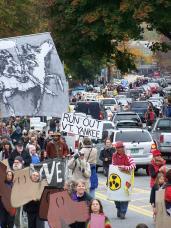 The Vermont senate in February 2010 voted to close Vermont Yankee in March 2012. Unless Entergy is able to get the Vermont senate to reverse itself before March 2012 -- and unless Entergy is able to get a judge to overrule the senate -- the reactor will close by 2012. In recent years, some public hearings in and around Brattleboro on the reactor's future have drawn as many as 500 people, the vast majority of whom were in favor of closing the plant. Volunteers with the Vermont Public Interest Research Group (VPIRG), the state's biggest environmental organization, spent last summer knocking on doors and speaking with people about why Vermont Yankee should be closed. "We've been finding tremendous support for closing Vermont Yankee," said VPIRG director Paul Burns. "Because of the way the prevailing winds blow, New Hampshire would probably be most affected by an accident. So we're getting support from people in New Hampshire and Massachusetts, too." Burns predicted that Entergy would outspend the antinuclear groups "1,000 to one" on lobbying and advertising. "But our odds are better than theirs," he said. "If there's any state where the public will can prevail in a fight like this, it's Vermont." Vermont Yankee opened in 1972 and was sold to Entergy by a group of New England utilities in 2002. The new owner promptly sought and eventually won regulators' approval to ramp up power production to 20 percent more than the plant had ever before produced. There have been a string of accidents at Yankee, including a fire in 2005 and, in 2007, a spectacular cooling tower collapse, which sent debris and hundreds of thousands of gallons of water cascading several stories to the ground. In January 2010, Entergy was found to be leaking nuclear waste into the Connecticut river, which farmers in western Massachusetts use to irrigate vegetables. The leak still has not been fixed. In 1987, James Asselstine, then a member of the Nuclear Regulatory Commission appointed by President Ronald Reagan, told the New York Times that there was a 45 percent chance of a meltdown at a nuclear reactor somewhere in the United States by 2007. Spending one dollar on energy-efficiency programs like Efficiency Vermont saves approximately three times as much energy as spending one dollar on nuclear power generates, according to a study by Amory Lovins published in 2005 by the journal Nuclear Engineering International. The dollar spent on energy efficiency also creates more jobs than the dollar spent on nuclear power, according to David Goldstein of the Natural Resources Defense Council. Submitted by Anonymous on Tue, 03/22/2011 - 08:17. Submitted by Anonymous on Wed, 03/23/2011 - 17:48. "...[T]he amount of radioactivity people outside the evacuation zone are exposed to is likely to be small, even if we include the amounts in food and tap water." Also, "Right now, according to measurements released by the Japanese government, people outside the damaged reactor are receiving between 1 and 100 microsieverts per hour of radiation. That’s well within the safe range." Submitted by Anonymous on Thu, 03/24/2011 - 08:36. As a layman who is well-versed in the health effects of radiation, I am offended by the misleading comments of TEPCO, Japanese and U.S. government officials and media commentators of the radiation being inflicted on the people of Japan, the region and the world. Radiation exposure is cumulative. As the work of Dr. John Goffman, a Manhattan Project participant, demonstrated back in the 1980s, there is no safe level of radiation. Every cumula­tive increase in exposure over a lifetime correlates to an increase in catastrophic health effects. When we hear government, nuclear industry or media comparisons of a radia­tion exposure to a chest X-ray or to back­ground radiation levels, as if these are nor­mal or safe, we are hearing the echoes of outdated Cold War propaganda when sci­ence was bent to serve nuclear ambitions. Every discussion of radiation exposure must include the fact that there is no level of exposure that is safe and that the dan­gers of exposure to background, medical or industrial radiation increase with each successive exposure. Just because people’s hair isn’t falling out and their skin hasn’t turned black doesn’t mean that any given exposure is not dan­gerous. Every exposure increases the risk and likelihood that negative health effects will be found. Comparing doses without stating that the dangers of exposure to radiation are cumulative is either a sign of a profound and inexcusable scientific illit­eracy, or a desire to mislead the public. Submitted by Anonymous on Wed, 03/16/2011 - 18:14. As a public expression of solidarity with the thousands of Japanese workers and residents affected by the still worsening nuclear disaster in Japan’s Fukushima Prefecture, there will be a solemn, peaceful vigil in front of the Vermont Yankee nuclear plant on Governor Hunt Road in Vernon, Vermont, this Sunday, March 20, at 1 p.m. If anyone is interested in biking to Vernon, Chad Simmons will be leaving the Brattleboro Food Co-op at 12:20 p.m. Submitted by Anonymous on Mon, 03/14/2011 - 14:35. Vermont Nuke is the same design as those in Japan that are failing. [VY and the Japanese plants were all built by General Electric.] The industry has changed dramatically since then. Even so, I am against nuclear energy and believe it to be every bit as bad (or worse) for the environment than gas or coal. And, of course, as witnessed from the events in Japan, nuclear energy can be devastating during a natural disaster. Entergy's response to major problems at Vermont Yankee, even if there is no danger of a tsunami or major earthquake hitting here, has been, and probably will be, woefully inadequate.